Book Racks Are Shipping Daily From Our Stocked Warehouse! 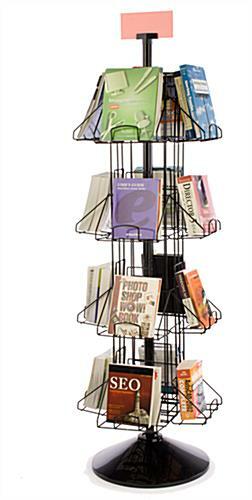 These Book Racks, Literature Racks Can Hold A Large Variety Of Publications, Including Oversized Brochures! 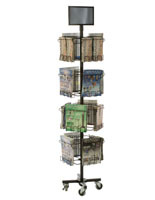 Rotating racks provide ease of viewing for customers! Top sign holder advertises your products! Extra deep pockets can hold up to 5" of material! 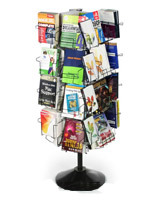 Extra thick 5mm wire construction is one of our most durable, high-quality book rack displays! 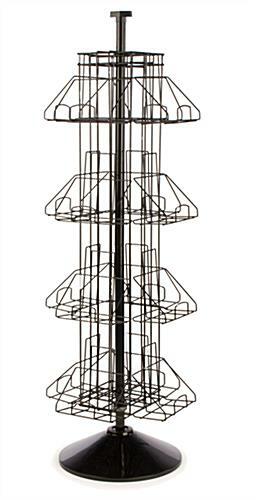 These book racks are a great choice for your book store, library, hardware store, or anywhere selling larger-sized books. Buy book racks to hold how-to manuals in a hardware store, programming manuals in an electronics store, textbooks in a college bookstore, or just to feature new authors or a popular series at a library. You could even fill the book racks with magazines. 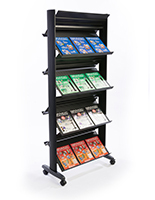 These book racks, such as literature displays, or rotating brochure holders, will complement the décor of your environment with their sleek gloss black powder coat finish. 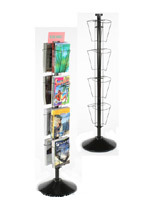 The displays are rotating book racks, making viewing all selections quick and easy for your patrons. The book racks can even be placed close to a wall, to save floor space, as the rotating design again allows for full viewing of materials. 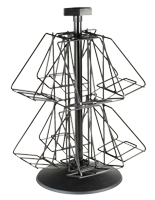 The literature stands, book racks offer a full view of materials within (16) 9-1/2"w x 12"h display pockets. Each pocket is 5" deep to hold thick books like novels, manuals, or school textbooks. 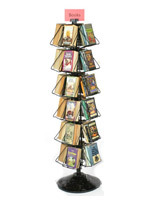 The book racks, also known as rotating literature stands, are crafted from heavy-gauge 5mm wire (most wire racks use only 3mm wire) for maximum durability. 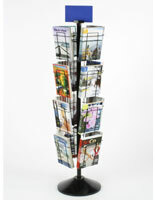 Easy to assemble, the book racks feature a wide base to prevent tipping and a sign holder to advertise your selections. 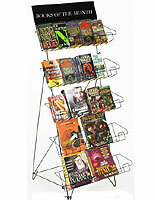 These book racks stand 69-1/4" high with a width of 21-1/4". Simple assembly instructions are included. 21.3" x 69.3" x 21.3"
9.5" x 13.0" x 5.0"